An Order Reference object is in the Draft state before being confirmed by calling the ConfirmOrderReference operation. 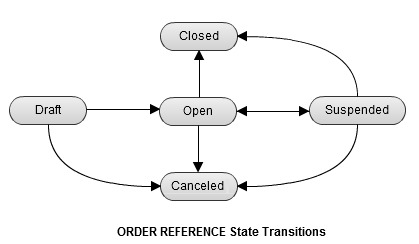 An Order Reference object moves to the Open state after it is confirmed by calling the ConfirmOrderReference operation. Authorizations can only be requested on an order reference that is in the Open state. An Order Reference object moves to the Suspended state when problems with the payment method are preventing Amazon from processing the authorizations. You cannot request new authorizations when the order reference is in the Suspended state. But you still can capture existing authorizations and apply refunds to captures. You should request another form of payment from the buyer if the Order Reference object moves to the Suspended state. InvalidPaymentMethod—There were problems with the payment method. The Order Reference object can be canceled by calling the CancelOrderReference operation, or it can be canceled by Amazon. You can cancel an order only if no money has been captured or charged on the order reference. Any pending authorizations are canceled, and no new payment operations are allowed in the future. SellerCanceled—You have explicitly canceled the order reference by calling the CancelOrderReference operation. You can specify the reason for the cancellation in the CancelationReason request parameter. Stale—You did not confirm the order reference by calling the ConfirmOrderReference operation within the allowed period of 3 hours. AmazonCanceled—Amazon has canceled the order reference. The Order Reference object can be closed by calling the CloseOrderReference operation, or it can be closed by Amazon. You cannot request new authorizations when the order reference is in the Closed state. Captures on existing authorizations are still allowed. Refunds on captures are also still allowed. Expired—You can only authorize funds on the buyer's payment instrument up to 180 days after the order reference is created. After this, Amazon marks the order reference as closed, and new authorizations aren't allowed. US: up to 15% or $75 (whichever is less) above the order reference amount. UK: up to 15% or £75 (whichever is less) above the order reference amount. DE: up to 15% or €75 (whichever is less) above the order reference amount. MaxAuthorizationsProcessed—An order reference created via AuthorizeOnBillingAgreement is closed by Amazon. Any approved authorizations can still be captured. MaxAuthorizationsCaptured—You have fully or partially captured 10 authorizations. After this, the order reference is closed by Amazon. AmazonClosed—Amazon has closed the order reference because of a failed internal validation or because of an A-to-z claim being decided against you. SellerClosed—You have explicitly closed the order reference by calling the CloseOrderReference operation. You can specify the reason for closure in the ClosureReason request parameter of the CloseOrderReference operation.